At the moment the capital of Syria is having its own nightmarish tale of two cities. I'm in the centre, not far from one of the world's great places - the walled Old City of Damascus. It contains the 1,400-year-old Umayyad Mosque and so many layers of history that Roman columns prop up arcades in the souk, and people still live and work in the street called Straight, where the Bible says St Paul stayed after he was struck blind on the road to Damascus. The other Damascus is in the modern suburbs. Armed rebels control big chunks of them, though they're also surrounded by the regime's forces. In the past week they've been pounded by artillery. To my British ear the word suburbs brings up a vision of the place where I grew up - gardens, laurel hedges, children dawdling to school and, at the weekend, the scent of Sunday lunch. Damascus suburbs aren't like that. They're concrete and breeze-block jungles, expanded chaotically for poor people who migrated to the capital looking for work when life in the countryside just got too hard. One of the reasons that so many people decided they were prepared to risk death to oppose President Bashar al-Assad, were the consequences of the worst drought in Syria's recorded history, between 2006 and 2011. According to the UN, it wiped out the livelihoods of 800,000 people. In north-east Syria, 85% of the livestock died. The regime made matters worse by subsidising big land owners who intensively farmed thirsty crops like cotton and wheat. North-east Syria is now a stronghold of the rebellion. In Damascus, some of the men who carry guns against the president once worked in parched and dying fields. The poor burned with anger, had no stake in the status quo and were desperate enough to challenge it. Until around a month ago, the war in Syria had seemed to be in a stalemate. Neither side could defeat the other. 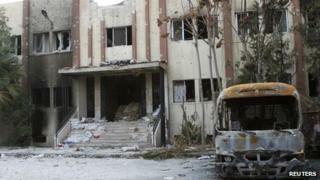 It doesn't feel like that anymore, and that's because the armed rebels have stepped up their operations in Damascus. I was here last in January. The reason why I haven't been back to Damascus is that you need a Syrian visa to come here, and they're hard to get these days. At the beginning of the year, armed rebels were just appearing for the first time in the suburbs. I was astonished when one morning I joined a convoy of journalists heading for the funeral of a protester and found that a few minutes after the last police roadblock, the Free Syrian Army was in charge. Since then, little by little, the rebels have built their strength. Damascus is not about to fall, but its centre - the regime's hub - is starting to feel as if it's under siege. That's not literally the case. The regime controls plenty of roads in and out. But security zones to keep bombers away surround government buildings and military HQs. The front of the chief of staff's headquarters, not far from where I'm staying, has been blown off. The roads in from the suburbs are cut by roadblocks, and Damascenes complain about appalling gridlock traffic, caused by the number of streets closed for security reasons. And then there's the shelling. It comes from the centre out to the suburbs so it's not as if shells are landing near government buildings, but when shellfire is in the soundtrack of a city, it cannot be normal. The other day I had a chat with Mokhtar Lamani, who works with the UN envoy Lakhdar Brahimi. I don't think any diplomatic challenge is bigger than the one they've taken on. They're trying to find a political deal to end the war. Mr Lamani, a convivial Canadian-Moroccan, spelt out what could go wrong. The alternative to a settlement, he said, was a failed state, fought over by warlords like Somalia. Mr Lamani said Syria could be even worse, because Somalia was relatively isolated, and Syria was intimately connected to its neighbours through family, religious and ethnic ties. It's in a pivotal position in the most politically congested, fragile part of the Middle East. In Tripoli in Lebanon this week, at least a dozen people were killed as factions supporting the two sides in the Syrian war fought each other. Syria's other neighbours - Iraq, Turkey, Jordan and Israel - can already feel the heat coming over the border. The stakes could not be higher. The outlook could not be worse.